LEVEL UP! is a crazy mix of side-scrolling platformer/shooter and some role-playing elements. I’m going with “new retro” style for it, for several reasons. So, I decided to try voxels (3D pixels), and it turned out quite well. Special thanks to Sproxel – it’s in early development, but already very useful. 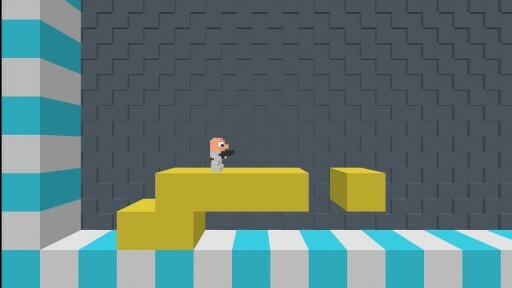 Coming soon: character control and shooting, resulting in a video of violent voxel destruction! This entry was posted in LEVEL UP! and tagged dev, LEVEL UP!, screenshots, sproxel, voxels. Bookmark the permalink. Both comments and trackbacks are currently closed.